Postdoctoral researchers from the David Geffen School of Medicine at UCLA impressed judges last month with their scientific acumen, poise and ability to articulate the significance of their work at the 2017 Giannini Fellowship competition in Pebble Beach, California. 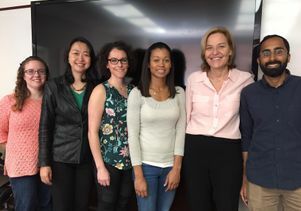 Expertly coached by an advisory committee chaired by Dr. Ming Guo, a 2001 Giannini fellow alumnus herself, four UCLA postdocs competed against 22 applicants from accredited medical schools in California. The UCLA scientists captured three of the eight available fellowship awards — the most of any participating institution. Dr. Jonathan Braun, chair of pathology and laboratory medicine; David Eisenberg, a professor of biological chemistry and a Howard Hughes Medical Institute investigator; and Jack Feldman, a distinguished professor of neurobiology, provided feedback to the UCLA candidates during several practice rounds. 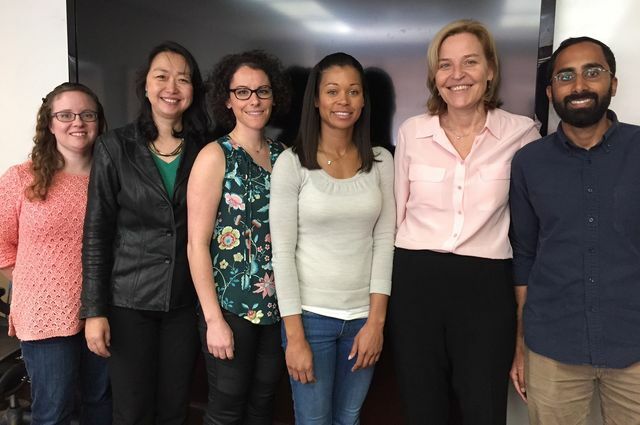 The Giannini Foundation awarded fellowships to Astra Bryant from Ellisa Hallem’s lab; Emily Mankin from Dr. Itzhak Fried’s and Nanthia Suthana’s labs; and Janal Carr from Owen Witte’s lab. Each awardee will receive $150,000 over three years, as well as intensive training in communication and leadership to enhance their transformation into successful scientists. Since its inception in 1945, the A.P. Giannini Foundation has funded more than 700 postdoctoral researchers in a campaign to advance the translation of biomedical science into cures for human diseases and to produce trained investigators.